Drones are becoming increasingly popular around the world for recreational and commercial purposes. Using a drone on St Helena is permitted, but flights must be conducted safely and lawfully so that air traffic is kept safely separated from drone flights and that the privacy and safety of the general public is maintained. 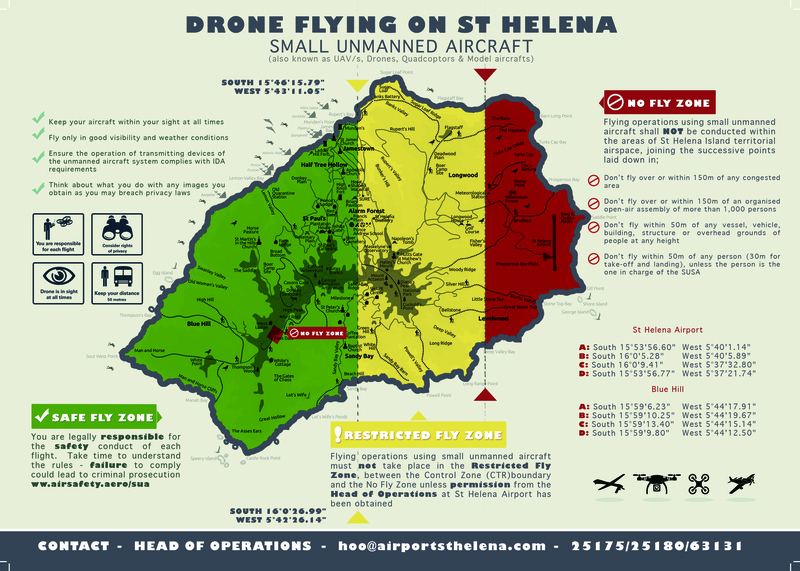 There are a number of rules and regulations in respect of the use of drones on St Helena, and these are enshrined in the Air Navigation (Overseas Territories) Order 2013 and the Aerodrome Regulations. In the Air Navigation (Overseas Territories) Order 2013, drones are referred to as SUAs (Small Unmanned Aircraft) or SUSAs (Small Unmanned Surveillance Aircraft). SUSAs are drones which are fitted with a camera or other recording device. Some rules will apply to all drones, regardless of their intended use or weight. 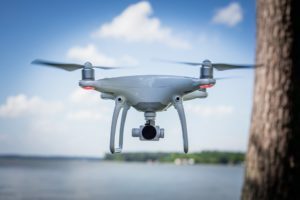 Others relate to whether the drone is being used for recreational or commercial purposes, it’s weight, and whether it is fitted with a camera or other recording device (an “SUSA”). Permission to operate a drone on a commercial basis must be obtained from our regulator Air Safety Support International (ASSI) prior to operations commencing; please see below for further details. What are the rules on flying a drone on St Helena? Observe your drone at all times – it must always be in unaided visual range and fly at least 50 metres (165ft) from other persons, vehicles, vessels and other property. Drones must not fly over or within built-up areas or crowds of more than 1000 people at a height of less than 150 metres (500ft). Drones must not be used in “Follow Me” or “Track Me” mode unless visual contact is maintained at all times. Ensure you understand your legal responsibilities. If you wish to fly an SUSA at less than the minimum limits defined in the DRONE requirements above, you must have written permission from ASSI prior to doing so. In addition to these DRONE requirements, the below restrictions are in place. A ‘No Fly Zone’ is now in force to the east of the Island. This No Fly Zone encompasses the approach paths to the Airport and the airspace in the immediate vicinity of the Airport. No SUA or SUSA flights are permitted in the No Fly Zone at any time. There is also a small No Fly Zone in the immediate vicinity of the Blue Hill VHF station – this is to ensure the continued safety of communications equipment vital to the safe operations of the Airport. Again, no SUAs or SUSAs may fly in the defined area at any time. No SUA or SUSA flight may be conducted in the Restricted Fly Zone without prior permission from the Airport. This applies to all drones, regardless of weight, size or whether a camera or other recording device is fitted. Permission to fly will not normally be refused, but permission will not be granted on days when flights are scheduled or expected. Please click on the map below to find out where drone flights can and can’t be conducted. I have a camera attached to my drone – what are the restrictions? In addition to the DRONE requirements noted above, users of drones which have a camera or other recording device fitted must consider privacy issues when overflying other people, or property not owned by them. Taking still or video images on St Helena is, with the exception of the No Fly Zone, entirely acceptable. However, you must consider privacy issues when you conduct your flights and note that you must not overfly crowds or built-up areas such as Jamestown without prior permission from ASSI. I’m wish to sell or trade images to a commercial entity – what do I need to do? If you are using your drone for commercial reasons – capturing stills or video images for gain and/or commercial enterprises – you must obtain permission from ASSI prior to conducting the flight/s. To do this, you will need to complete an application form, send them an operations manual and risk assessment, and evidence of sufficient public liability insurance. For more information, please see the Air Safety Support International (ASSI) website. If you are conducting flights on a commercial basis (known as “Aerial Work”) then you will need public liability insurance. If you are using your drone for entirely recreational purposes, then insurance is not mandatory. However, if you intend to overfly other people and property which does not belong to you, it is strongly recommended that you purchase sufficient insurance to cover you in the event that damage or injury is caused to property or people by your drone. If you need to contact the Airport to request permission to fly your drone in the CTR or have any other queries, please contact the Head of Operations directly or telephone reception. Contact details can be found on the Contacts page. Air Safety Support International (ASSI) in the UK can be contacted on +44 1293 214040 or via their website (http://www.airsafety.aero) ASSI is a wholly-owned subsidiary company of the UK’s Civil Aviation Authority, promoting aviation safety in the UK’s Overseas Territories.